Photographic Archive Appeal – Or – Did You Really Have That Beard? Figure 1: Two of the terrets from the chariot burial, one (left,WWE01 332AR) with coral studs and the other (rigbt, WWE01 332AO) with a glass/enamel stud. Scientific analysis of material from the Iron Age chariot burial at Wetwang, East Yorkshire (see PAST 38), has identified the use of birch-bark tar as an adhesive in the harness fittings. The burial, excavated in 2001, dates to the Middle Iron Age and contained the skeleton of a mature female along with an iron mirror and dismantled chariot. The harness fittings, comprising rein rings (terrets), horse bits and strap unions, were all found in their original positions along the line of the chariot yoke. The terrets (Fig. 1) and strap unions are made of bronze and decorated with coral studs, which were probably originally pink/red. In at least one case, red glass ‘enamel’ inlay was used in place of, or to replace, a coral stud. Each coral stud (Fig. 2) is held in place with a bronze pin passing through its centre and then into a plug of dark brown/black and rather friable adhesive behind. The adhesive plug is accommodated by recesses in bosses on the fittings, so that the coral studs sit proud on the ring. In some cases the coral is in two pieces, perhaps broken when the studs were drilled or pierced for fastening with the central pin, and here the adhesive is used to join the two halves and secure them to the pin. Analysis of the adhesive by scientific staff at the British Museum using gas chromatography-mass spectrometry (GC/MS) has revealed the presence of triterpenoid compounds (betulin, lupeol, lupanone and others) which are characteristic of birch-bark tar, as well as a few diterpenoid compounds indicative of a softwood resin or tar. Birch-bark tar is produced when the bark of Betula sp. (birch) is heated in excess of 300-400º C. Chemically-identified finds of birch-bark tar span European prehistory from the Middle Palaeolithic (Koller et al. 2001) into the Roman period (Charters et al. 1993) and beyond. It is still manufactured today in some regions. Although most common in Northern Europe, finds are widespread and use of the material has been reported as far south as Greece (Urem-Kotsou et al. 2002; see Pollard & Heron (1996) for a review of finds in prehistoric Europe). Figure 2: Magnified images of two of the coral studs from the terret WWE01 332AR. On the right, birch bark adhesive is concealed behind the coral, but on the left, it is ivisble where is has been used to join the two halves of the stud. While there is archaeological and documentary evidence for sophisticated and large scale production of birch-bark tar in the medieval period (Kurzweil & Todtenhaupt 1991), little is known of its preparation in prehistory. Methods involving heating the tar in pottery vessels have been tested (Kurzweil & Todtenhaupt 1990), but evidence for the use of birch-bark tar pre-dates the introduction of pottery by several millennia, and experiments in tar preparation without pottery vessels have not been entirely successful (Czarnowski & Neubauer 1990). Sometimes the tar is mixed with other materials, for example animal fat (Dudd & Evershed 1999) and other plant tars (Regert et al. 1998). The Wetwang tar seems to have been mixed with resin or tar from a conifer, possibly pine, a mixture that, to our knowledge, has not been reported before. Unfortunately, not enough chemical indicators survive in the mixture to ascertain whether the pine material was a resin or tar (pitch). If the latter, separate tars could have been mixed to produce the adhesive, or the plant materials could have been combined prior to manufacture. Though birch-bark tar has been used as a coating or sealant (Hayek et al. 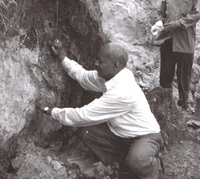 1991; Urem-Kotsou et al. 2002), and was chewed in the Mesolithic (Aveling & Heron 1999), it was chiefly exploited for its adhesive properties and thus the nature of its use here is very typical. The Wetwang horse fittings are, however, probably the most exquisitely crafted items with which the product has been associated to date. Aveling, E.M. & Heron, C. 1999. Chewing tar in the early Holocene: an archaeological and ethnographic evaluation. Antiquity 73, 579-84. Czarnowski, E. & Neubauer, D. 1990. Aspekte zur produktion und verarbeitung von birkenpech. Acta Praehistorica et Archaeologica 23, 11–14. Dudd, S.N. & Evershed, R.P. 1999. Unusual triterpenoid fatty acyl ester components of archaeological birch bark tars. Tetrahedron Letters 40, 359-62. Hayek, E.W.H., Krenmayr, P., Lohninger, H., Jordis, U., Sauter, F. & Moche, W. 1991. GC/MS and chemometrics in archaeometry. Investigation of glue on copper-age arrowheads. Fresenius Journal of Analytical Chemistry 340, 153–56. Koller, J., Baumer, U. & Mania, D. 2001. High-tech in the middle Palaeolithic: Neandertal- manufactured pitch identified. European Journal of Archaeology 4, 385 –97. Kurzweil, A. & Todtenhaupt, D. 1990. Teer aus Holz. Berlin: Museumsdorf Duppel. Kurzweil, A. & Todtenhaupt, D. 1991. Technologie der Holzteetgewinnung. Acta Praehistorica et Archaeologica 23, 63–79. 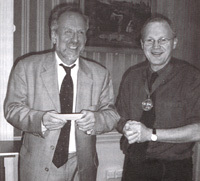 Pollard, A.M. & Heron, C. 1996. Archaeological Chemistry. Cambridge: The Royal Society of Chemistry. Regert, M., Delacotte, J., Menu, M., Petrrequin, P. & Rolando, C. 1998. Identification of Neolithic hafting adhesives from two lake dwellings at Chalain (Jura, France). Ancient Biomolecules 2, 81-96. Urem-Kotsou, D., Stern, B., Heron, C. and Kotsakis, K. 2002. Birch-bark tar at Neolithic Makriyalos, Greece. Antiquity 76, 962–7. The supervolcanic eruption of Toba 74,000 years ago was the largest eruption of the Quaternary and is hypothesized to have decimated human populations, principally those outside Africa. Although Toba is located in northern Sumatra, this eruption was of such great magnitude that it resulted in the deposition of a blanket of tephra (volcanic ash) over South Asia. Tephra deposits, up to 0.34m thick, have been found in marine cores either side of the Subcontinent as well as in a number of terrestrial localities in India, where reworked ash deposits range from 0.2m to 6m in thickness. What was the extent of the impact of this eruption on human populations in India? My doctoral thesis is addressing this question by collecting and analysing evidence from archaeological, palaeontological, palaeoenvironmental and genetic sources. Fieldwork is an essential component of this research and with the help of a grant from the John and Bryony Coles Bursary, I was able to pursue initial investigations in India in 2003. At a few of the terrestrial localities, tephra deposits are found in association with Palaeolithic artefacts. A comparison of technology before and after the eruption will enable conclusions to be made about the extent of the eruption’s impact on human populations in these localities. The principal aim of my three-month visit was to relocate some of these tephra deposits and to gain a better understanding of the relationship between Toba tephra and the Indian Palaeolithic. The first six weeks of my visit were spent in Kurnool district of Andhra Pradesh surveying a cave-rich area with teams from both British and Indian universities. Here, we discovered an exceptional area, rich in both volcanic ash and archaeological remains from the Lower Palaeolithic to Megalithic periods. We made the reasonable assumption, for several reasons, that the source of the tephra is the Toba supereruption of 74kyr BP, although we have yet to chemically analyse this tephra. Further work at this locality promises to elucidate the impact that this eruption had on Palaeolithic populations in this area of southern India. Figure 2: Tephra from the 74,000 year-old Toba eruption at Khutiali in the Middle Son valley, Madhya Pradesh, India. The tephra is being sampled by Dr Gupta of the University of Allababad, Uttar Pradesh. After Kurnool, I travelled to the eastern state of Orissa with the aim of visiting previously documented Toba tephra sites and to search for any associated Palaeolithic remains. With the help of scholars from Utkal University, Bhubaneswar, two sites were identified in the Mahanadi river basin. However, the state of preservation of these deposits was poor, perhaps due to modern cultivation practices or recent monsoon floods. Further fieldwork was carried out in the Middle Son Valley in Madhya Pradesh. This is an area rich in both Pleistocene fossil fauna and Palaeolithic artefacts. It is important because Toba tephra deposits have been found in association with such remains. With a group of scholars from Allahabad University, we relocated a Toba tephra deposit reported in 1993 and gained an understanding of both the topography of the area and the depositional environment. Lithics from the Middle Son valley and the neighbouring Belan valley were then viewed in Allahabad University Museum. Subsequent library-based research at the Deccan College Postgraduate and Research Institute in Pune indicated that palaeoliths abound in most, if not all, of those river valleys where Toba tephra has been documented. As yet, however, the artefacts and tephra deposits have not been placed together in any clear stratigraphical sequence. Establishing the correct relationships between tools and tephra is essential in order to understand the impact of the Toba eruption on these Palaeolithic peoples. Future fieldwork in India will focus on this problem and on the collection of empirical data for statistical analyses. I would like to thank The Prehistoric Society for awarding me a grant from the John and Bryony Coles Bursary. This financial assistance was a significant factor behind the success of this fieldwork project. This short conference, organised in association with the Prehistoric Society, complemented a research day held the previous year focusing on the earlier Neolithic. Vicki Cummings, the co-organiser, together with Amelia Pannett, introduced the proceedings with an account of the excavations she has been undertaking with Chris Fowler at Cairnderry chambered tomb, Dumfriesshire. Their search for Neolithic monumentality, or at least a date for the tomb, revealed a number of Early Bronze Age cremations together with a stone battleaxe! This provided a useful opening contrast, it would seem, between the architecturally elaborate and public performances of the Neolithic and the restrictive, small-scale depositional displays of the Early Bronze Age. The limited geographical focus of many of the papers did not prevent more general themes being addressed. How, for instance, were monuments created? In some cases this appears to have been an accumulative process, whereby the final form emerged through repeated installations that respected existing physical and conceptual structures, without adhering to a ’blueprint’. So argued Colin Richards in one of the early papers, and his viewpoint certainly found support in the excavations at Battle Moss stone row, Caithness, reported on by Amelia Pannett, Andrew Baines and Kenneth Brophy. The stones appear to have been erected incrementally, each one subtly referencing, through its alignment, an existing monument in the surrounding landscape. Richard Bradley, on the other hand, argued convincingly that the initial phases of the construction of the Tomnaverie recumbent stone circle anticipated the later form that the monument would take, specifically the position of the recumbent on the south-western edge of the cairn. Unravelling the architectural complexities of monuments was important in Martyn Barber’s account of some recent results from English Heritage’s National Mapping Programme, particularly at the West Kennet palisade enclosures near Avebury. Cole Henley explored how an apparently unique monument, Callanish on the Isle of Lewis, combined allusions to a variety of geographically disparate architectural forms. Most notably, its cruciform shape reflected the layout of the chambers in the major passage tombs of Brú na Bóinne. Adrian Chadwick, Paul Huckfield and Joshua Pollard interlaced video, poetic and archaeological narratives as they explored the monumental and the everyday in the landscape of Gray Hill, Monmouthshire, where the cairn, which is the current focus of the excavations, ’came into being’ as subsequent generations reworked its structure. The distinction between a later Neolithic of large communal monuments and an Early Bronze Age where sites had a local and more individual focus was both supported and challenged. Peter Rodgers and Aaron Watson’s fieldwork in the Lakeland Fells has revealed a monumental miscellany, including platform cairns, ring banks, and enclosed outcrops. The small-scale and restricted landscape of these features parallels the pattern identified in other upland regions such as the Peak District and North Wales. The burial of the ’Amesbury Archer’, recounted by Andrew Fitzpatrick, told of another side to Early Bronze Age monumentality: a burial of a central European metalworker associated with a remarkably rich array of objects – the ’king of Stonehenge’? There were challenges to these orthodoxies. Colin Richards sought evidence of status-seeking individuals in the construction events at Late Neolithic monuments such as the Stones of Stenness. Using recent sociological theories of ‘risk’, he argued that those who organised the procurement, movement and erection of a stone did so at risk of failure; taking on and living through such risks was therefore an important means of establishing and maintaining social status. Frances Healy, in turn, took an enduring symbol of individual status and power in the Early Bronze Age, the round barrow, and argued that these may have operated as important arenas for communal performances: at Raunds, barrow 1 included 200 cattle skulls of which 35 were killed at the event of its construction; if consumed, these would have fed 1000 people for a week. Overall, this was an interesting and stimulating day and the organisers and speakers are to be thanked for their hard work and the excellent quality of the papers. Final comment is reserved in support of the fine range of biscuits and cakes offered with coffee and the, hopefully to be repeated, performance of passing the leftovers amongst the audience during the last paper of the day. The 9th EAA annual meeting was co-ordinated by Nick Petrov and took place in St Petersburg State University, Peter the Great Museum of Anthropology and Ethnography and the State Hermitage Museum. The opening ceremony on the evening of the 10’” welcomed the delegates to the city in its tercentenary. Sessions (more than 60 in number) were organised around three thematic blocks: I – Theory and interpretation of material culture; II – Cultural heritage and the management of the archaeological record; and III – Archaeology in the modern world. Sessions fell into one of three types: sessions with organisers, general sessions organised by the meeting hosts, and round tables with more of a discussion format. These session types cross-cut each thematic block, and were spread over three days. A wide range of discussion was thus facilitated. Thematic block I contained sessions geared towards the presentation of new findings. The location of the meeting facilitated more Russian archaeologists to present their research to the EAA than in previous years and consequently there were many sessions covering the archaeology of Russia and the steppe regions. The themes of regional identity and ’east meets west’ were returned to via different approaches in many sessions where papers were presented by researchers from different geographical areas. Thematic block II was comprised of sessions introducing various forms of heritage management and representations of cultural history and identity, again with a multinational presence. Round table discussions on such themes were intended to bring together discussants and identify common causes in the sphere of managing our collective past. Thematic block III was largely concerned with how to take Archaeology forward. The public audience, education, national identity and the digital age were all the focus of sessions and round tables. The annual party and annual dinner both provided Russian entertainment, and as the vodka flowed, these events proved to be occasions to remember. Trips to heritage sites on the Sunday were optional extras to the conference, and were well-attended. Delegates were also permitted free access to the State Hermitage Museum which houses a vast collection of antiquities and art from all ages and areas, and to the Peter the Great Museum of Anthropology and Ethnography. The meeting proved a great success and the spectacular location added to this. Many delegates are undoubtedly looking forward to the Tenth Annual Meeting taking place in Lyon from the 8th to 11th September 2004. Lucy Verrill is a doctoral research student at the University of Edinburgh, investigating the rnarginality of prehistoric agricultural societies in Western Ireland. The 13th Europa Prize was awarded to Professor Leendert Louwe-Kooijmans of Leiden University following the AGM on 19 May (Fig. 1). His lecture on The Adoption of Farming in North-western Europe as seen from the Dutch Delta was rather poorly attended for a Europa Lecture but thoroughly enjoyed by all present. Drawing on the results of recent large-scale excavations on the route of a new national rail-line – the first ’commercial’ archaeology undertaken in the Netherlands – Professor Louwe-Kooijmans presented a wide-ranging, superbly argued and wittily presented discussion on chronology and cultural developments at the Mesolithic-Neolithic transition and beyond. Sadly, Lady Clark feels unable to attend in person any longer so the award was presented by our President, Graeme Barker. 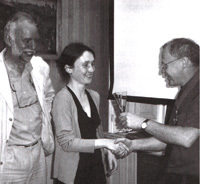 The Bagueley Award for 2003 was presented to Chantal Conneller and Tim Schadla-Hall for their paper in PPS 69, Beyond Star Carr: the Vale of Pickering in the 10th Millennium BP (Fig. 2). A special award of an engraved rose-bowl was presented to our Honorary Indexer, Bridget Trump, who has completed 35 years of unsung heroism preparing annual indexes for the Proceedings (Fig. 3). 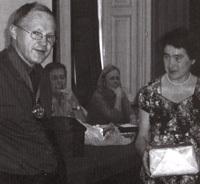 Long-standing members will remember that, in the late 1980s, Lesley Wynne-Davis, in her role of Hon. Archivist, built up several albums, using prints provided by members from study tours. This record, now held by John Cruse, starts with the 1960 Netherlands trip and continues through into the1990s, when the collection was discontinued. As a sampler of its contents, Fig. 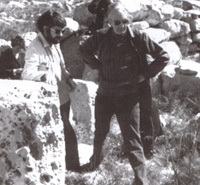 1, from the 1977 Malta tour, shows Dr Ian Kinnes and Prof John Evans discussing a mortar at Kordin, whilst Fig. 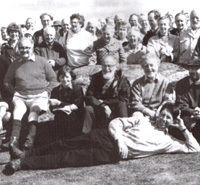 2, from the 1988 Aberdeen trip led by Prof Thurstan Shaw, shows the whole party at Tomnaverie Recumbent Stone Circle – with our then Meetings Secretary, Andrew Lawson, being particularly recumbent and our PR Officer, Alan Hill, in eye- catching shorts! With digital photography increasingly replacing ’old fashioned’ prints and slides, it is likely that members will periodically contemplate ’thinning-out’ their photo collections, raising the prospect of such memories being lost. Can I therefore take this opportunity to ask anybody with any surplus photos of the Society’s past activities to contact me on j.cruse@btopenworld.com (or by mail via Tessa) and I’ll do my best to ensure that such memorable images continue to be added to our archive? Last summer saw the initiation of a project which will employ geophysical survey to enhance archaeological understanding of settlement forms and ritual activities at Maya sites in Belize. The Belize Electromagnetic Explorations Project (BEMEP) was designed to explore prehistoric Maya non-platform dwellings and to locate caches and offerings in plazas using the geophysical technique electromagnetic induction (EM) at the archaeological sites of Minanhá and Pusilhá, Belize. The BEMEP research team is comprised of the principal investigator, Tracy Sweely, and the field supervisor, Gerald Trainor. The team conducted reconnaissance investigations at the two sites in the spring of 2003 in preparation for EM survey in the spring of 2004. Goals for the 2003 reconnaissance included experiencing topography and terrain, specifically in relation to settlement at each site, defining locations where EM surveys would take place and examining subsurface composition and construction materials to establish expectations for EM survey results. Other goals included learning project-specific protocols for research at each site and assessing the logistics of travelling to and working at each site. During the reconnaissance, the BEMEP research team met with Geoff Braswell of SUNY Buffalo, director of research at Pusilhá under the Pusilhá Archaeological Project (PUSAP), and Gyles Iannone of Trent University, director of research at Minanhá under the Social Archaeology Research Project (SARP). The BEMEP research team was able to examine the central precincts and various locations within the settlement zones of each site. Five locations were chosen for EM surveys in 2004. At Pusilhá, EM survey will be conducted in the Stela Plaza in an attempt to locate buried stela fragments, offerings, caches and burials. An EM survey will also be conducted in a residential and agricultural zone south of the Gateway Hill Acropolis. At Minanhá, two plazas within the central precinct were chosen for survey. The area in the settlement zone of Minanhá chosen for EM survey is located within a region of the site known as the Minanhá Regional Survey area. In addition, any areas at each site cleared and burned by local farmers in 2004 will be assessed for inclusion in the survey based on density of prehistoric platform architecture and topography. Subsurface composition at each site was discussed and examined where possible in tree-falls, eroded slopes and in looters’ trenches and in excavation profiles where available. The subsurface at both sites consists of weathered and unweathered limestone bedrock overlaid by clay varying in thickness from 0 cm to more than 1 metre. Non-platform floors have not been encountered at either site, but little excavation has been done in the settlement zones. Such features are likely to be composed of materials like those found in other lowland Maya sites (limestone plaster, fired clay, or built directly on the ground surface). Platform foundations are composed of clay fill, limestone or chert cobbles and pebbles, and often secondary deposits such as trash fill. They are thus similar to those found at other sites in the lowland Maya region. 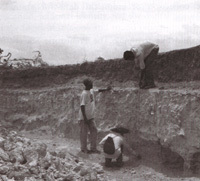 These subsurface conditions were found to be extremely conducive to EM survey during a pilot study at Chau Hiix, Belize, in 1996 (Sweely submitted). As the field season at Pusilhá was ending, it was not possible to obtain first hand experience with project-specific research protocols, but this will be addressed at the beginning of the 2004 survey. For the Minanhá project, the principal investigator spent one day in the laboratory and the field supervisor spent two days participating in the field school student orientation in order to gain first hand experience with SARP protocols. The BEMEP field supervisor will drive to Belize for the 2004 field season; thus transportation will be available to and from each survey location, as well as for when the principal investigator arrives in Belize via aircraft with the EM instrument. During the 2004 season, Dr. Braswell indicated that the BEMEP research team could stay with the PUSAP research team in a hotel at the nearby town of Blue Creek. During the set up and execution of the survey of the plaza groups at Minanhá, the BEMEP research team will stay at the Martz Farm, a contemporary farmstead and Eco-lodge and the base of operations for SARP. For the survey in the region of outlying settlement, the BEMEP team will set up a temporary camp near the settlement survey area. Overall, the 2003 reconnaissance was successful. Virtually all of the goals for the reconnaissance were met. In addition, valuable time was spent interacting with the directors and personnel of PUSAP and SARP that indicates a compatible working arrangement. We would first like to thank the Prehistoric Society for their generous support of the BEMEP 2003 reconnaissance. We would also like to thank Geoff Braswell and Gyles Iannone for their interest in and support of BEMEP. In addition, we are grateful to the Department of Archaeology in Belize for allowing us to work in their amazing country. Finally Tracy Sweely would like to thank Ben and Susan Weems for their unwavering love and support and for ”time off” to pursue this work. Sweely, T. Submitted. Detecting ’Invisible’ Dwellings in the Maya Area using Electromagnetic Induction: significant findings of a pilot study at Chau Hiix, Belize. Bronze Age Forum The fourth Bronze Age Forum will be held at the University of Southampton on Saturday 13th and Sunday 14th November 2004 and is open to anyone with an interest in the Bronze Age archaeology of Britain and Ireland. The meeting will be organised into a series of thematic sessions in which speakers will discuss recent research and discoveries. For full programme details, as well as information regarding enrolment and suggested accommodation please visit our website: www.soton.ac.uk/~baforum1/. Registration fees are £23 waged or £17 student/unwaged and include all conference materials, refreshments and buffet lunch on both days. There will be a wine reception on Saturday evening. Please note that there are a limited number of places available and you are advised to book early to avoid disappointment. Should you require any further information please contact us at baforum1@soton.ac.uk. Tom Greeves reports on his discovery, on 4 April 2004, of an unrecorded stone row of striking proportions, plus an adjoining barrow, in one of the remotest and highest locations of northern Dartmoor. Figure 1: Plan of the stone row and ditched barrow. The small cairn shown on the plan may be modern; the stone on its south-west side has the letters JEW cut into its top surface. In the past thirty years the 100,000 acres (40,000 ha) of moorland Dartmoor in south-west England have been the subject of some of the most detailed . archaeological exploration and survey in Britain, surpassed only perhaps by the treatment given to Bodmin Moor in Cornwall. The work by Andrew Fleming on the territorial land boundaries known as reaves is internationally recognised, and Jeremy Butler’s five-volume Dartmoor Atlas of Antiquities (Devon Books, 1991-1997) is an unrivalled summary of the state of archaeological knowledge. English Heritage surveyors (in earlier guises employed by the Ordnance Survey or the Royal Commission on the Historical Monuments of England) have carried out numerous detailed area surveys. Moreover, there is a large well-informed constituency of interested amateur explorers who seek out Dartmoor features, sometimes as part of the ’letterboxing’ community who leave visitors’ books and ink stamps in containers for others to find. It is therefore all the more remarkable that a previously unrecorded stone row with very large stones has been noted for the first time on one of Dartmoor’s highest and remotest hills. Cut Hill (603m) is no ordinary hill, being one of only five Dartmoor points above 600m in altitude. To reach it requires a walk of about two hours from whatever direction. The hill has no rocky outcrops breaking its surface, but has a smooth domed shape. It is impressive and powerful, especially when approaching from the east, up the East Dart River. Its western flanks form the watershed of the River Tavy. The row, aligned 52º/232º (approximately NE/SW), is situated on the top of Cut Hill (SX 59928275) within an area of extensive but partially eroding blanket peat. It consists of six large slabs of granite all lying flat in the same orientarion (approximately ESE/WNW). 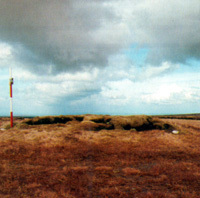 Five of the slabs are visible within a 100m strip of ground where the peat has eroded by either natural or human agency, and appear to be on a prehistoric land surface about 1.4m lower than the present top surface of the peat. They are spaced between 19m and 29.5m apart, and so regular in line and proportion that they give the impression of railway sleepers. From the south-west end the stones have the following maximum dimensions (in metres) in plan: 2.3 x 0.9; 2.4 x 0.8: 1.85 x 0.7; 1.9 x 1.2; 2.6 x 0.7; 2.1 x 1.05. Each stone appears to be approximately 0.20m thick. In other words, they are all carefully chosen slab-like stones, which, if upright, would have their thinnest profile visible when looking along the axis of the row. The recorded length of the row formed by the six stones is 123m. A seventh probable stone lies 34.5m further north-east, almost entirely buried bv peat, and with only 0.8 x 0.5m of its surface visible. Preliminary probing suggests thax it is 1.15m wide and at least 1.7m long. Its visible long side is orientated SE/NW. The most south-westerly stone has what appear to be small packing stones still in situ at its north-west end. One of these is visible on its south side, and six are visible close together on the north side. The largest of these packing stones is about 0.40m long. The row is tangential to a ditched barrow on the very highest point of Cut Hill, 58m WSW of the most south-westerly stone of the row. A projected line of the row would pass within about 22m of the centre of the barrow. The barrow itself consists of a superficially almost stone-free mound some 14m in diameter and about 1.5m in height. Beyond the mound there are suggestions of a berm about 1.5m wide, and then a surrounding ditch about 2m wide, defined by an outer ring bank also up to about 2m wide. Not all these elements are distinct all the way round the barrow. The waterlogged ditch is a particularly unusual feature to be visible on a Dartmoor barrow. The discovery radically alters the perception of prehistoric presence on Dartmoor. Within a 3 km radius of the hill, virtually no prehistoric structures had previously been identified. The large cairn known as Quintin’s Man can be seen 2.6 km to the north-east; the standing stone known as Beardown Man is 3.2 km almost due south; the large settlement at Watern Oke is 3.3 km to the west; and a small settlement on the west bank of the West Dart River is some 2.6 km to the south-south-east. It is at an altitude 100m higher than any previously known row on Dartmoor. The spacing between the stones is without parallel on Dartmoor. The stones are among the largest used for a Dartmoor row. The row on Stalldown on southern Dartmoor has six large stones (1.9- 2.6m) at its northern end, and that across Piles Hill, also on southern Dartmoor, has stones which average 1.6m in length (Butler 1993, 60-4). The stones appear to have been very carefully chosen in terms of their shape. Of special interest are the messages potentially contained in the peat associated with the row. It is usually suggested that blanket peat began forming at 600m on Dartmoor in the 4th millennium BC (e.g. Caseldine & Maguire 1981, 8). Could the row be as early as this, or are we to assume that the peat formed later? Why are all the stones lying in the same direction? – were they pushed, or were they placed there but never erected? The packing stones around the south-westerly stone seem to contradict the latter hypothesis. A programme of more detailed research is being planned. The implications for what else might be buried beneath the blanket peat of Dartmoor are massive. Perceptions of prehistoric Dartmoor will never be quite the same again. As a human statement in the so-called ’wilderness’ of northern Dartmoor this row is of great significance. Its discovery will hopefully give a new impetus to prehistoric studies in the region. Tom Greeves is a freelance cultural environmentalist. He trained as a prehistorian (Edinburgh University 1969-1973) and was formerly archaeologist to Dartmoor National Park Authority (1979-1985). Special thanks are due to Elisabeth Stanbrook for help with survey, and to Chris Chapman for discussion and photography. Butler, J. 1993. Dartmoor Atlas of Antiquities, Volume Four: The South-East. Exeter: Devon Books.